Today I’m reviewing ArcSyn by SPC Plugins. A relatively new software synth which is on the market since early 2016. 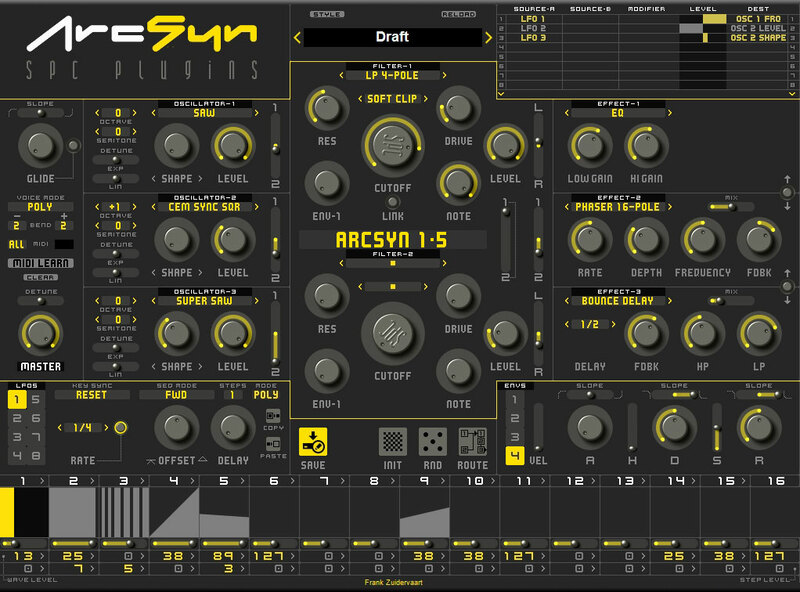 The current version of the synth is v1.5, and that’s the version I’ll review here. We blend this all neatly together and we have… ArcSyn! But, most important… how does it taste? Well, quite delicious I might say! 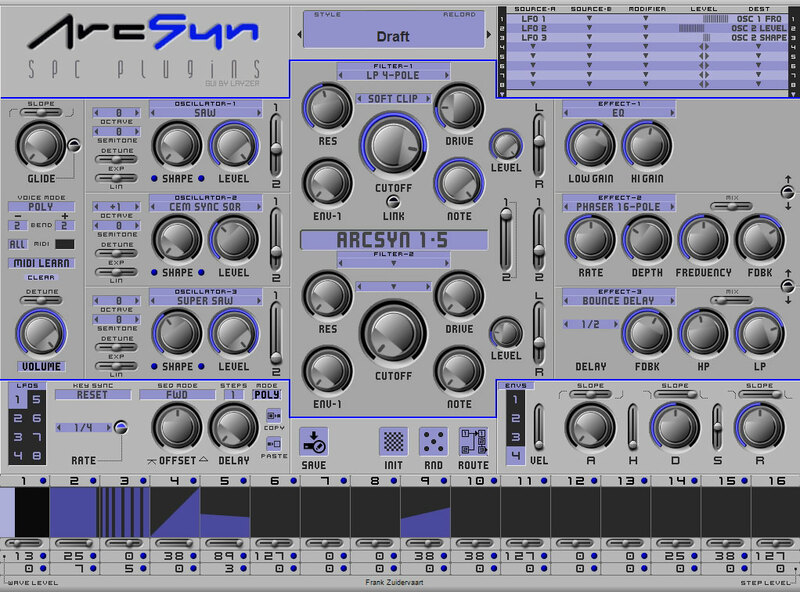 ArcSyn is based on a virtual analog synth architecture, but it’s much more than that. The goal of this synth is not to emulate classic hardware analog synths, but rather explore other territories which are not only restrained to typical virtual analog sounds. And it does this very nicely. I found the synth to be well equipped with a nice number of oscillator waveforms, filter types and LFO waveform types. But what’s quite unique about ArcSyn is the ability to sequence LFO waveforms in a step sequencer, which the manual of the synth refers to as “LFO wave sequencing”. This feature brings some wacky modulation possibilities to the table. But more about that later. The synth has 3 oscillators which can generate 71 different waveforms. You can select the common waveforms like sine, triangle, pulse, and saw, but also waveforms like cosine saw, super saw, hard sync saw, fm bell, wavetable, etc. Most of these waveforms can be adjusted with a shape knob. Think of pulse width for the pulse waveform, wave selection for the wavetable waveform, detuning with super saw, …you get the picture. So you can imagine that you can create quite some interesting sounds by mixing these three oscillators. Now, there are 2 filters which can be set in series or parallel. There are the usual VA filter types like LP, HP, BP in 1,2,3 or 4 pole versions but also comb, notch and more exotic filter types like phaser, scramble, frq squash, etc. Quite a nice selection. The filters also have a drive knob with 8 selectable drive types (tube, soft clip, metal, etc.) to add some extra color to the sound. ArcSyn is equipped with 4 AHDSR envelope generators from which 2 are pre-patched to AMP and Filter Cutoff, but can be used to modulate other destinations as well. Now, by far the most interesting feature of ArcSyn we find in the LFO section. This section contains no less than 8 LFO’s which can generate a slew of different waveforms including some which are animated or have different shape variations. But the real modulation heaven begins when we sequence these waveforms in the step sequencer which we’ll find in the LFO section as well… This “LFO wave sequencing” is a very neat feature of this synth, and really invites to go “out of the box” with your sounds. There are 16 slots in the sequencer, and each of these slots can be set with a waveform. This can be standard waveforms but also animated waveforms. There are some controls to further fine-tune values for step length and shape variations. The step sequencer can also be programmed with semitone values to create programmed note output for the oscillators. What’s important to realize here’s that every one of the 8 LFO’s has its own step sequencer. So you can create 8 different sequencer programs each with sequenced LFO waveforms and semitone data, and in the modulation matrix of ArcSyn we can direct the output of each LFO (sequencer) to separate destinations. You can even use two LFO’s as source and combine and process them together with different modifiers like multiply, smooth, quantize, etc. I think you can imagine that this feature really invites for experimentation for us sound design enthusiasts. I already touched the subject a little with the LFO section, but ArcSyn also has quite a decent modulation matrix. We’ll find 16 modulation slots here where we can connect (combined) modulation sources with various modulation destinations like oscillators, LFO’s, filters, etc. Modulation levels can be set with positive or negative values. The effect parameters can’t be modulated. That’s not a big absence, but it would be a nice future feature. I do mention this because the possibility to modulate effect parameters is not uncommon on current synths. At the end of the signal path we find a three slot effect chain. These can be routed in series or parallel. Most common effects are present here. There’s reverb, various delays, choruses, phasers, etc. To round this up, Arcsyn offers 32 voices of polyphony, aftertouch and has four voice modes: Poly, Rotate, Mono and Legato. Poly and Rotate are both polyphonic modes, but the Rotate mode is more similar to the voice handling of the early hardware polyphonic synthesizers. Furthermore we find a Glide function. Almost forgot… ArcSyn has a dedicated Init button. A very welcome and simple feature which not always finds its way to a new synths feature list. As for the GUI, the first versions of ArcSyn wouldn’t do well on a GUI beauty contest if that existed, but much has changed since then. Now in version 1.5 we find a GUI which looks a lot better than the first versions. There are even two extra GUI skins available now, and I think most of us will find a GUI here that fits their taste. The synth has excellent sound quality and quite a broad sonic palette. It’s very capable of delivering great classic analogue type sounds, quality digital fm type sounds and beautiful glassy and ambient style pads. Browsing through the 400 preset factory sound bank affirms that nicely. ArcSyn is a great addition to the range of already available software synthesizers and manages to take in its own unique spot. It offers good sound quality and a lot of sound design possibilities due to its LFO wave sequencing feature. If I must mention some minor cons it would be the absence of effect parameter modulation, and maybe the absence of drag and drop modulation or the inability to enter modulation / sequencer values with the keyboard. Let’s say these are future wishes. 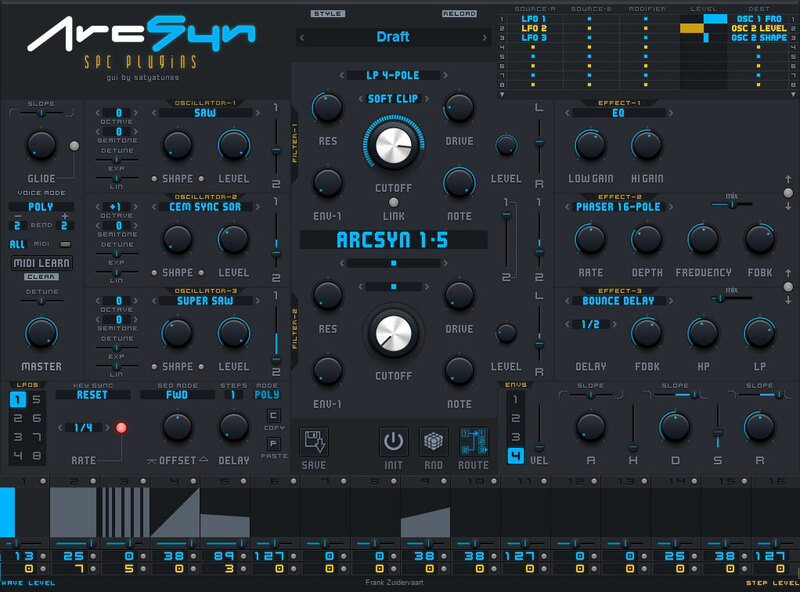 All in all I find ArcSyn to be a great, capable and unique synth. The price is $99 / €89 / £69 inc. VAT, which seems to me a very fair price for this gem! 25% off all SPC Plugins plugins during May. Enter MAY25 at the checkout to claim your discount. Frank Zuidervaart is a dutch synthesizer sound designer under his label “Krezie Sounds”. As a musician he likes to play some guitar as well (love the sound of a strat!). 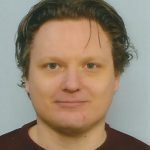 Furthermore he is an ICT professional and if he has some time to spare loves to play retro consolegames ("yeah, I’m a sucker for videogame nostalgia").Visit Krezie Sounds for free and commercial soundbanks for AAS Ultra Analog VA-2, Hive, Image-Line Harmless and VirtualCZ.